I've got books to review, too, but I'm behind on my links, so let's try to keep up! - In big book world/blog world news, the National Book Critics Circle led by John Freeman has launched a campaign to save the newspaper book section -- specifically, to keep the Atlanta Journal-Constitution from firing its book review editor and eliminating the section. The campaign has sparked interest everywhere, including this article in the New York Times positing that reviews may be moving from mainstream print media to blogs (and everyone's got an opinion on that one). The Times article mentions a bunch of my fellow Litblog Co-Op members -- major congrats, guys! I think many folks ultimately agree that newspaper book review sections and amateur literary blogs both are (or can be) vital parts of the nation's literary culture and conversation -- it's not an either/or thing. There's something to be said both for the professional editorial "filtered" atmosphere of a book review section (and its power to reach masses of readers who might not have been looking for books but find themselves interested), and for the "free-wheeling" passionate amateurism (by which I only mean unpaid, not poor quality) nature of litblogs, which attract a niche audience based on a writer's voice and have some freedoms mainstream media doesn't. As I've mentioned before, I think book review sections are super important to keep books in the forefront of our cultural conversation, and I'm signing the NBCC's petition to keep them around. Take a look around at the conversation swirling around this issue and make up your own mind; I'd be curious to hear what you think. - Speaking of the conversation and the internet, I've finally broken down and joined Shelfari, thanks to a personal invite from BEA director Lance Fensterman. And y'all are right -- it's super addictive, and super easy. Had I but world enough and time (sorry, Marvell), I'd be spending many an hour cataloguing my book holdings for interest and discussion. As is, I'm going to just try to make sure the books I review here on the blog are on my virtual "shelf". 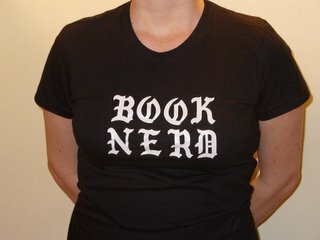 I'm booknerdnyc, of course -- feel free to befriend me in the big Borgesian library in cyberspace. Good book-nerdy fun! - And speaking of conversations between nerds, I was thrilled to be a part of a panel at New York's Museum of Comic and Cartoon Art this past Monday, as part of their ongoing MoCCA Mondays series. The subject was "Interstitiality and the Comic Book Industry," hosted by the Interstitial Arts Foundation. (It's a fancy word that means "in between", in case you wondered -- kind of like "liminal".) Since I'd just finished reading the IAF's new anthology Interfictions, and the ALP and I have spent way too many hours talking about comics and genre and where to shelve things in the bookstore, I was full of thoughts. The audience was small, but engaged, and it was great to share the conversation with a comics creator, a publisher, and a comics critic and explore the notion of betwixt-and-between that defines the interstitial. I'd highly recommend checking out any further projects coming from MoCCA and the IAF -- good thinkers about the flux-y state of things in the postmodern book world. That about wears me out for today. See you here on Friday -- happy reading!